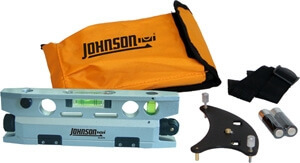 Johnson's laser torpedo level model 40-6174 is truly construction "job site tough" with its heavy-duty aluminum frame. What makes this torpedo laser level superior to the 40-6164 is its v-groove bottom, a plumber's dream to fit on a pipe, and its leveling base for level accuracy of up to +/- 1/8" at 50 feet. Its interior laser range is up to 100 feet for when long accurate runs are required. These torpedo laser levels are also magnetic for ease-of-use on the job, especially for an electrician or plumber. All Johnson's laser levels come with a 3-year no hassle laser level warranty and a 24-hour repair or replacement service.